Silk Blouse self design traditional Crop Top choli / readymade Blouse. A classy saree blouse that will add a touch of elegance to any saree you pair it with. *Please specify your color & size preference. This item in Saree Accessories category was first added to our catalog on 03-04-2017. Buy Silk Blouse w/ Sequins / Crop Top Ready-made Choli(XL, XXL), sold & shipped by DilliHaart where you can shop online for Indian Kurtis, Discounted Sarees, Anarkali Suits & Salwar Kurta. This Crop Top Blouse collection has been tagged as Crop Top Silk Blouse, Readymade Top, Belly Dance Costume, Women Clothing, Bahubali Bollywood Style. Hello what size is the choli? I am size 46 will it fit me? This blouse is only available in Black size. And fits 44 to 46 bust size. 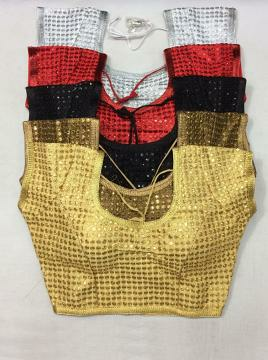 Designer Gold Blouse, Crop Top Ready-made Blouse 34"